My kids and I have a favorite Saturday brunch spot called Communal. 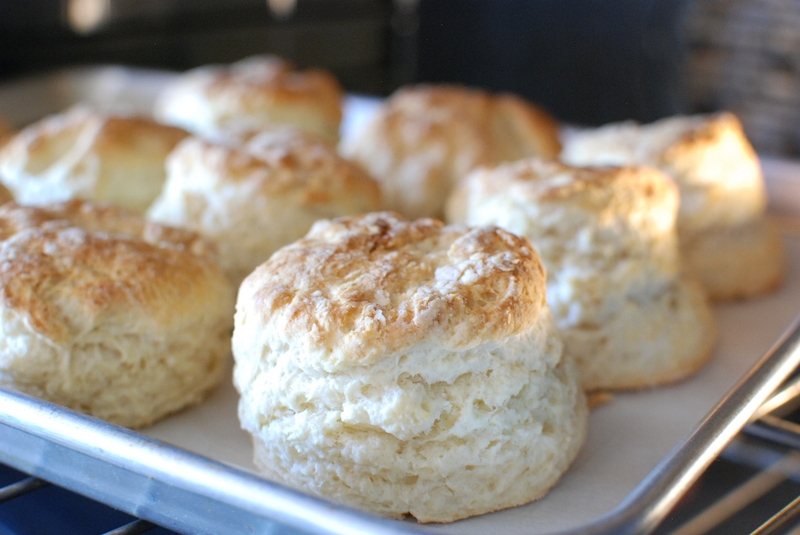 They make the most amazing buttermilk biscuits. They are buttery, oh so buttery. They are crisp on the outside and moist on the inside. Communal serves the biscuits with a small jar of homemade freezer jam or you can order their biscuits with sausage gravy. My son’s warned me they were amazing, but I didn’t realize how they would melt in my mouth until my first bite. Oh baby! Skyscraper buttermilk biscuits are not difficult to make. You need to follow a few simple rules. Rule #1 – Use cold butter. Don’t use shortening. Remember the tip in my pie dough recipe? Butter has a lower than body temperature, thus it melts in your mouth. Shortening leaves a film in your mouth. 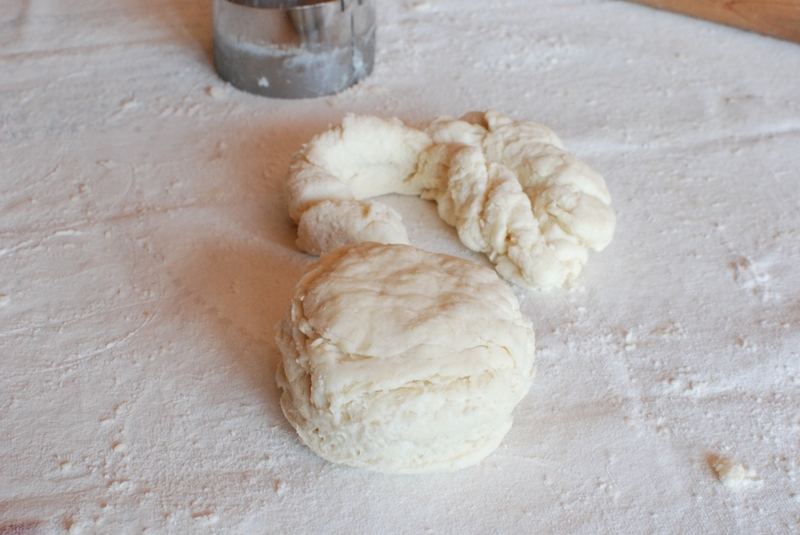 Rule #2 – Don’t work the dough very much. 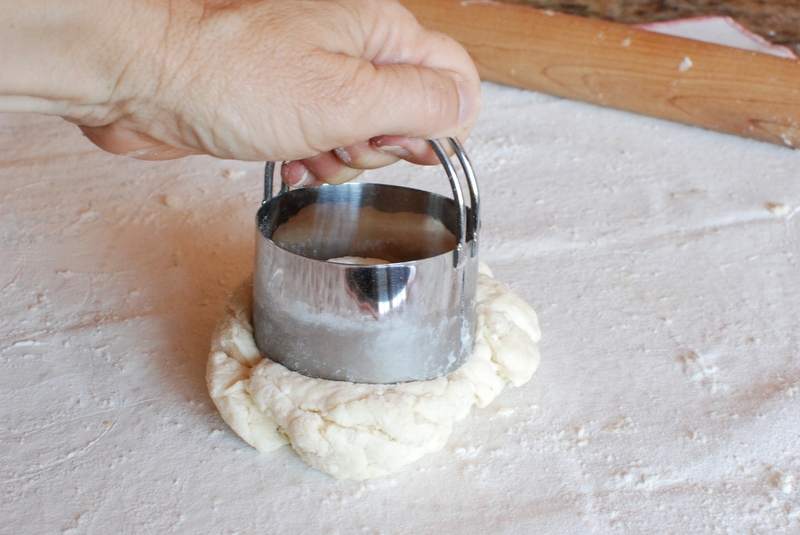 Handle the dough as little as possible. You just need a gently touch. 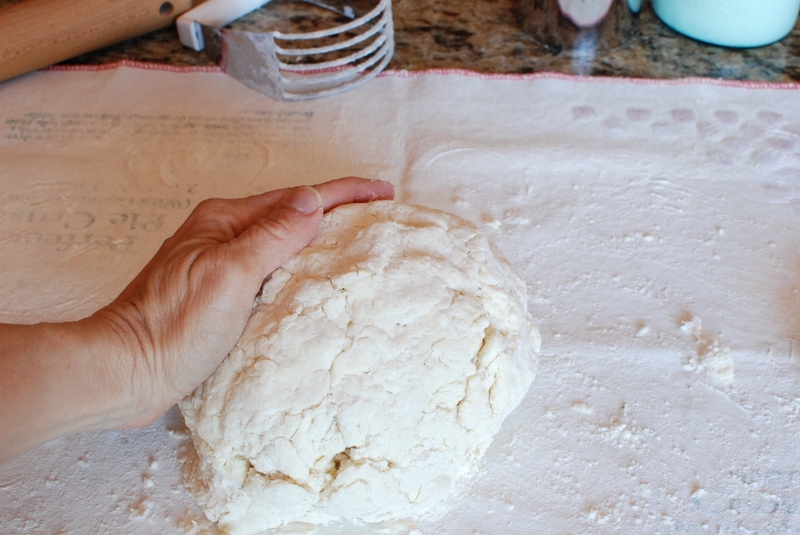 Rule # 3 – Pat the dough instead of rolling it. 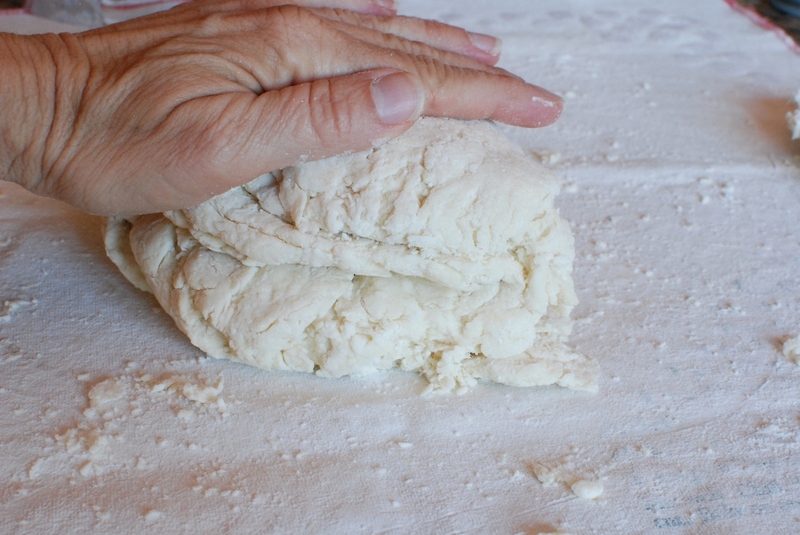 Rule #4 – Pat the dough thick not thin. This way the biscuits will be nice and TALL. 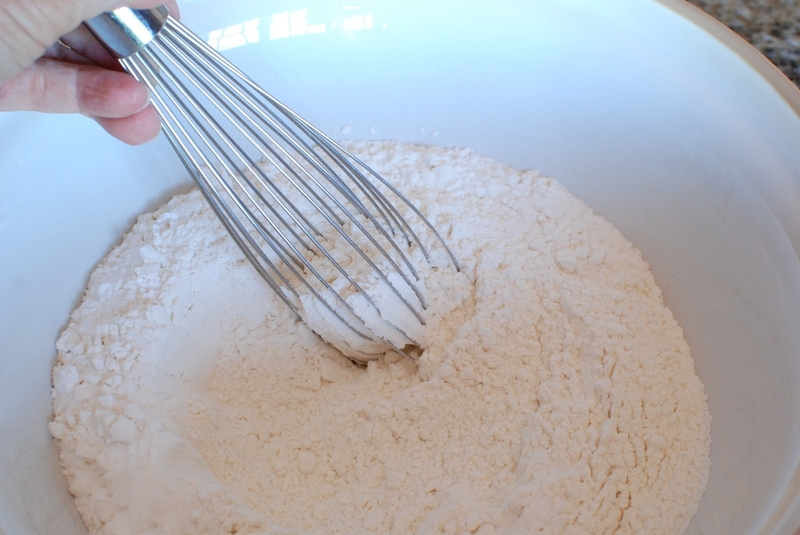 Whisk or sift the dry ingredients together. 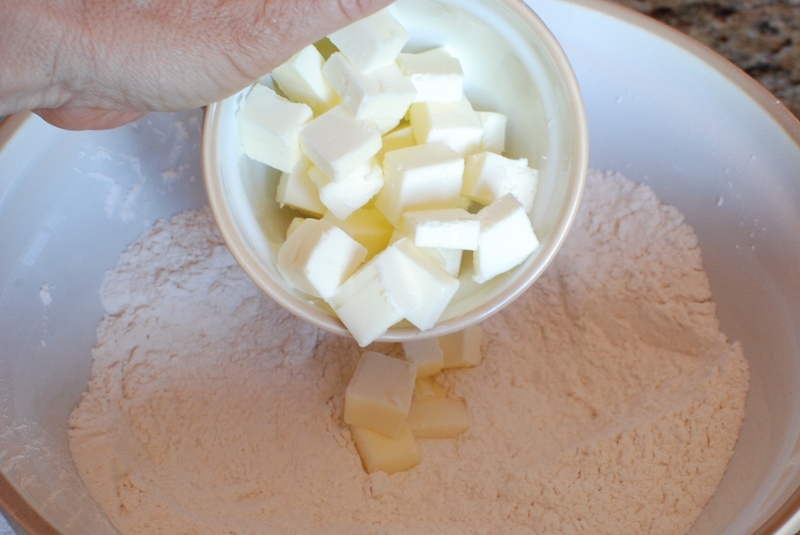 Add the cold butter that has been cut into about 1/2-inch size. 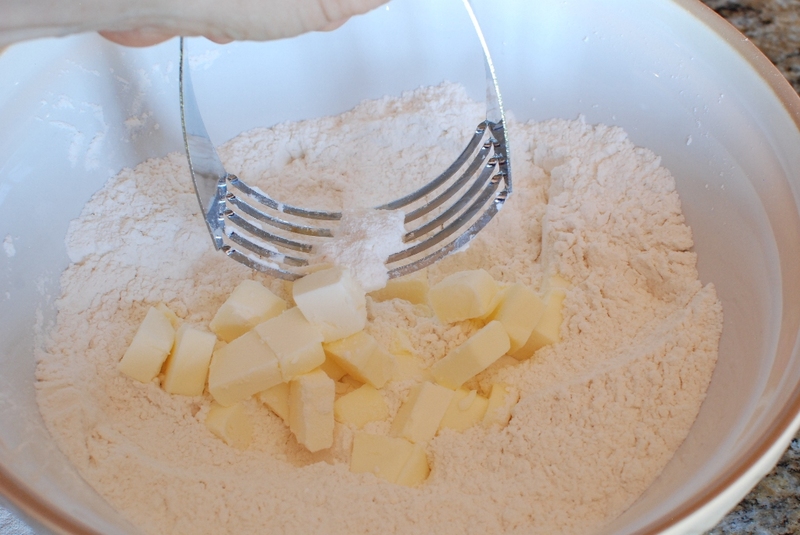 Using a pastry blender, cut the butter into the flour mixture. Yes! 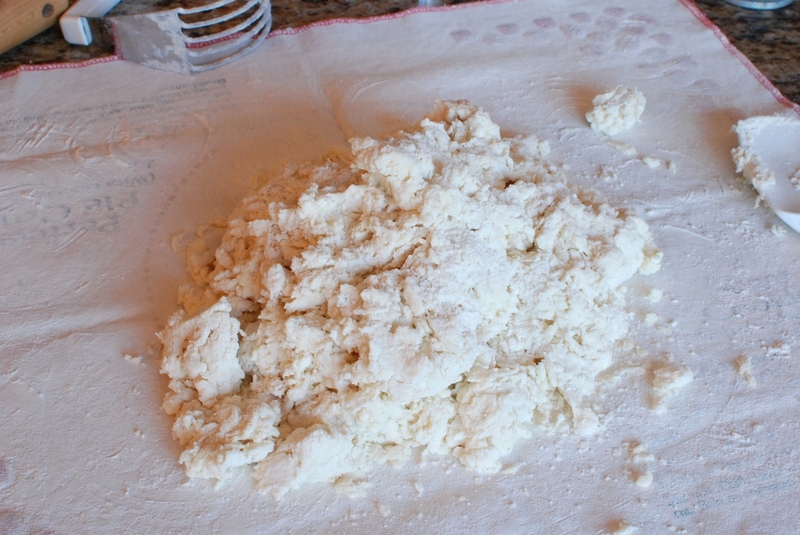 You may use a food processor. Only pulse the ingredients. Don’t over process. Yes! You may use an electric mixer fitted with a paddle. Careful not to over mix. Yes! You can use your hands. Don’t handle the butter too much or it will soften. Yes! You can use two knives to cut in the butter. 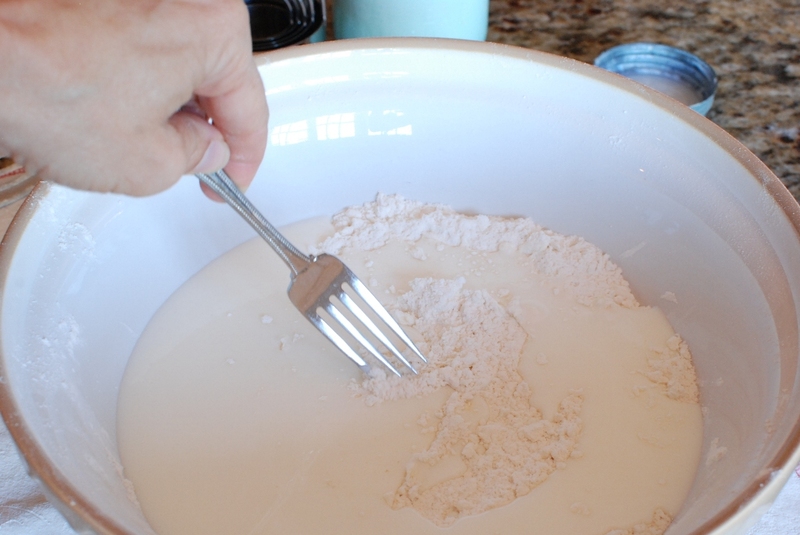 You want the flour to have very small pieces of butter. Smaller than a pea. 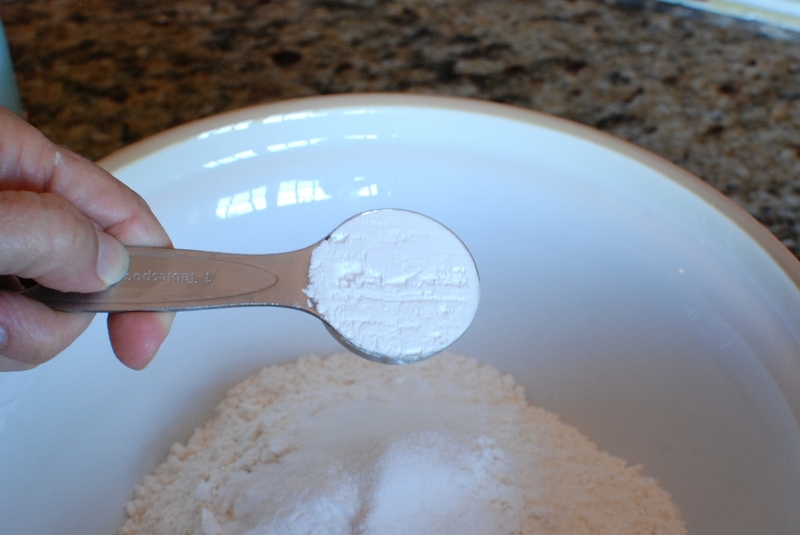 I like to use a fork to blend the ingredients together. This way I don’t over mix. 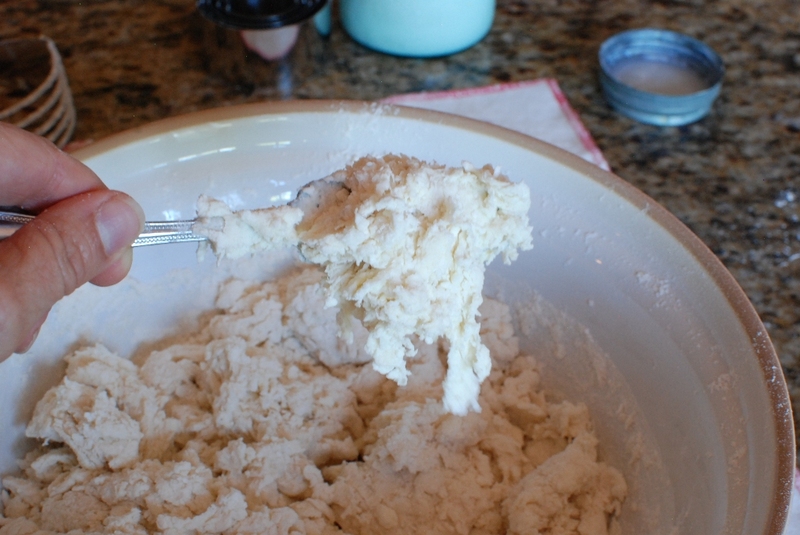 Stir the dough just until it holds together. 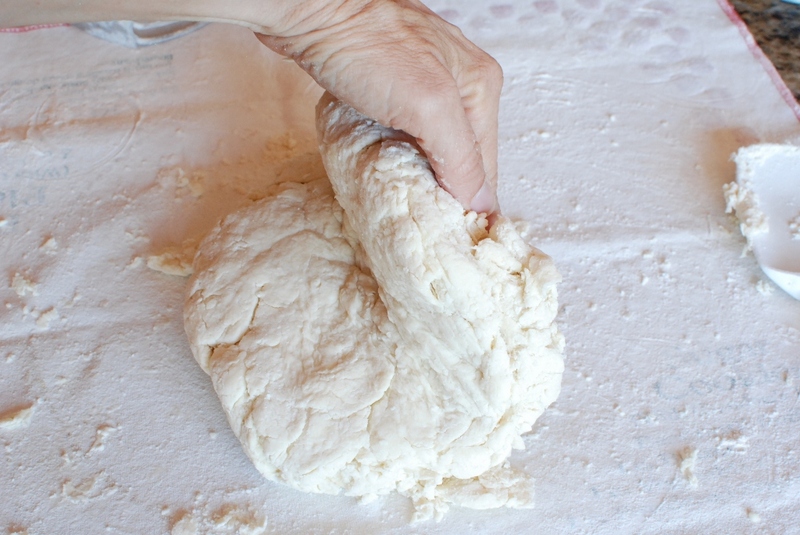 Gently press the dough together and knead it a few times. 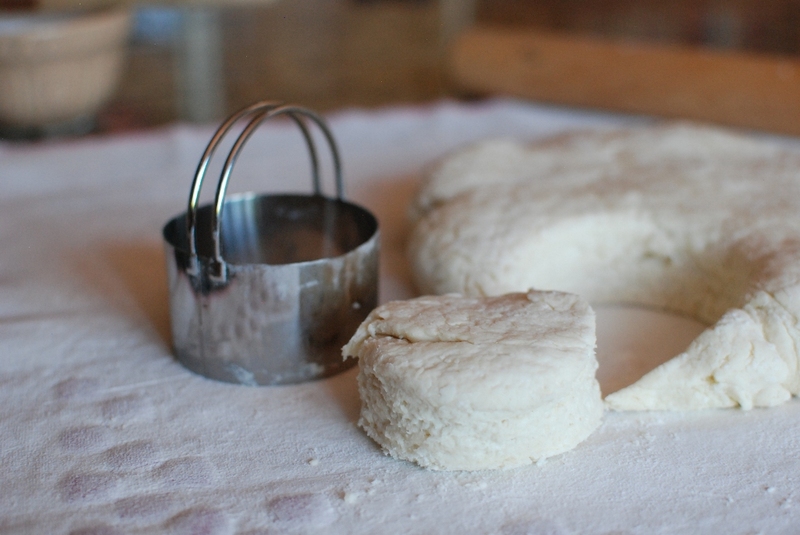 Flatten the dough to about a 1-inch disk. 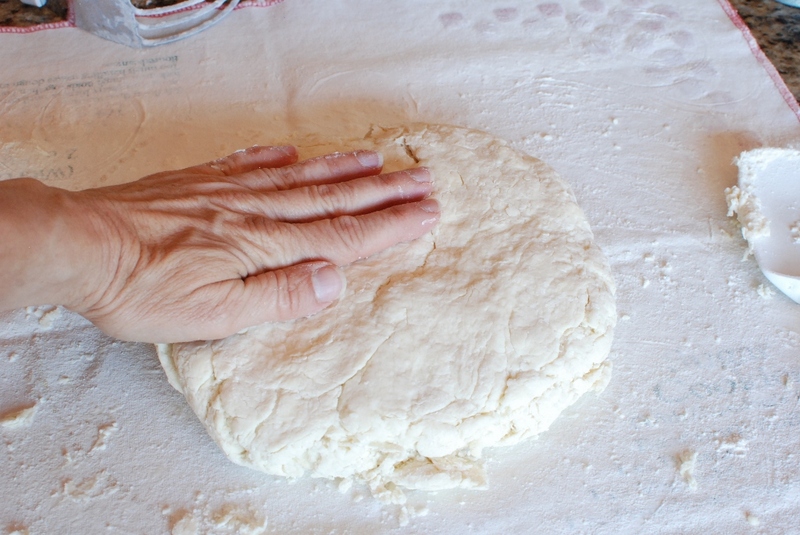 Gently pat the dough flat. 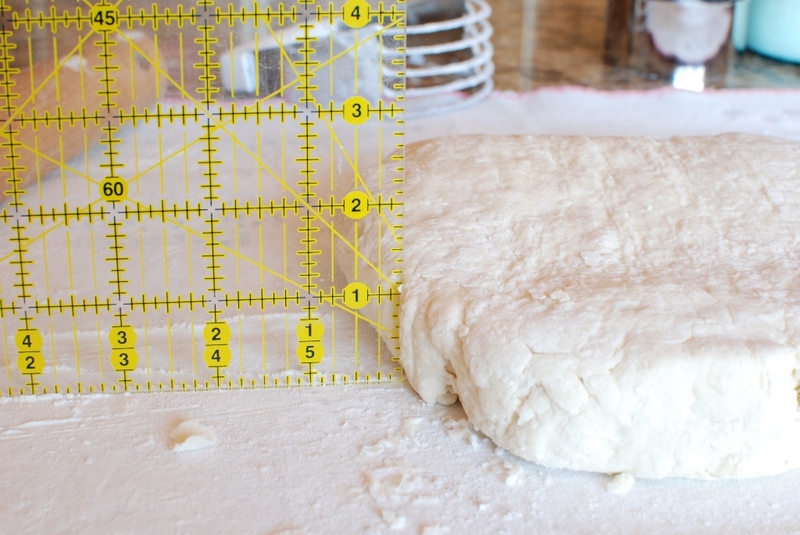 Cut the dough with a 3-inch round cutter. You can use a smaller size, if you wish. You will always have some scraps left over. 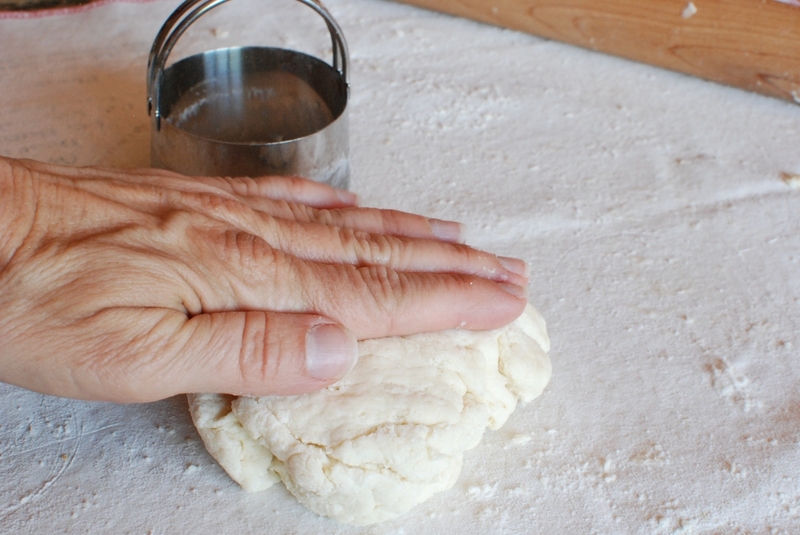 Gently press the dough together. Cut into a round. This lone biscuit generally rises weird and bumpy. It just does. You can just cut the biscuits into squares to avoid having the leftover dough. 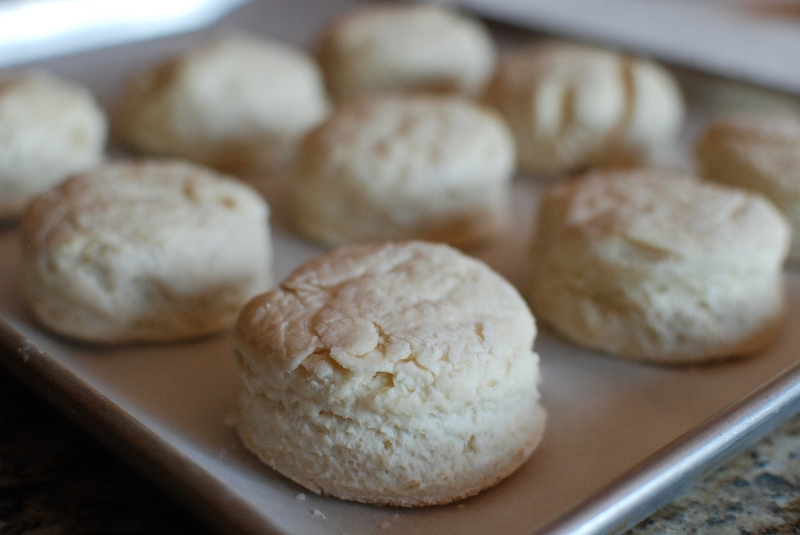 Place the biscuits on a lightly grease baking sheet or one that is lined with parchment paper. Bake in a 450 degree oven for about 22-25 minutes or until golden. They bake up so high and light. You can brush the tops with melted butter, which is optional. 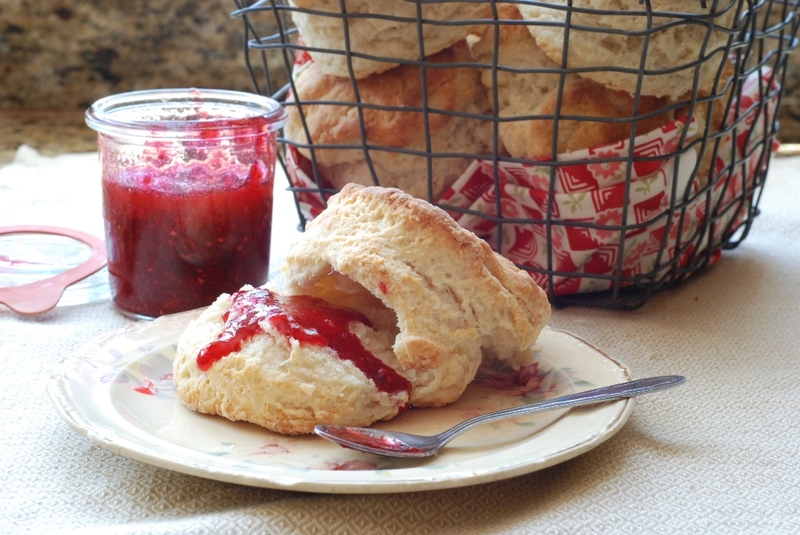 Serve the biscuits hot smothered with homemade jam. My grandkids like their biscuits dripping with honey. Ahhh! So do I. How many bisquits does this make? This makes about a dozen (12), but I roll the dough quite thick. 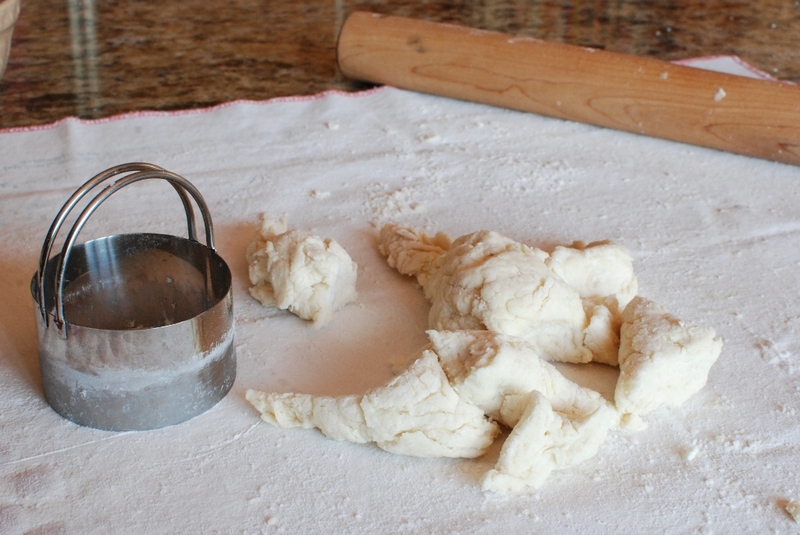 The dough can be rolled thinner and you could probably get about 18. How many bisquits does this recipe make? I made it and it was very yummy. Thanks for the recipe. Even my son who hates jams actually really liked it. Does wheat work in these biscuits? Wheat flour would make them heavier, of course. It's worth a try. I would use winter white hard wheat flour, if available. If the seem too heavy you could try a 50/50 blend. I live in Boulder county, Colorado, so I went with only 1 Tablespoon of baking powder as directed. They came out so big and tall! I ended up with only about 20 minutes due to my oven's hot spot… Will definitely make again. I used a food processor to combine the butter once it was already cut up into small pieces. It made 9 big ones. I didn't cut them very evenly and they were really all great anyway. Thanks for a great recipe!! All the pictures really help. I need one of those dough measuring things. Wahoo! Thanks for your comment. I love hearing success stories. My daughter lives in Parker, CO and is still trying to figure out the altitude. Doesn't matter the shape or size just as long as they taste fabulous. 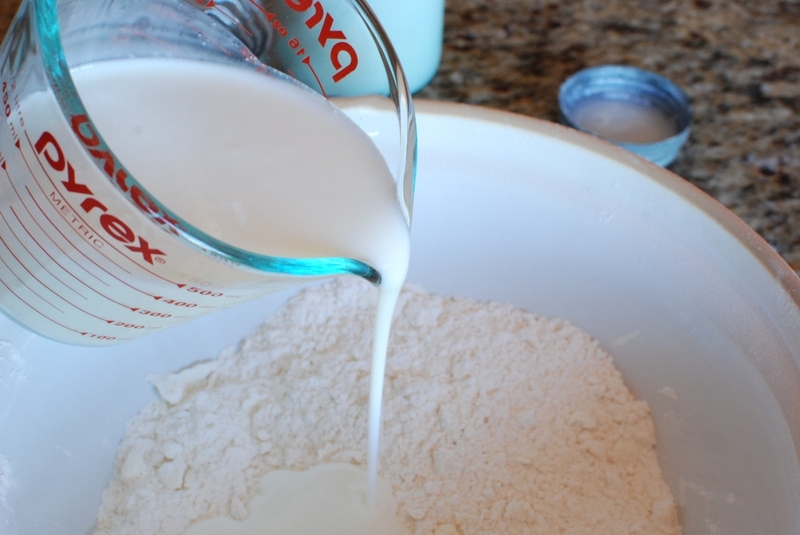 Hi, I tried this but as I do not have buttermilk, I used milk instead, omitting the baking soda. But my biscuits didn't really raise tall n high. Is it because of the milk? Taste is ok though. My girls still like them with jam. But its a bit blend on its own. 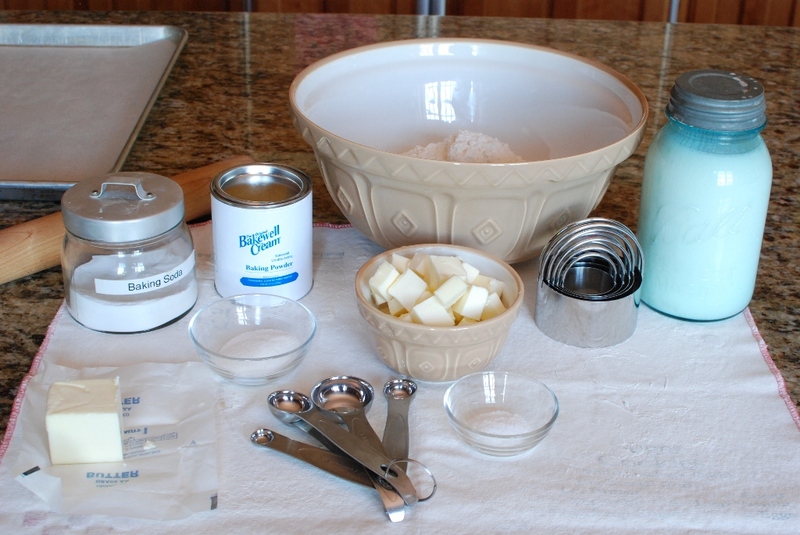 Hi Irene, You can "sour" milk by adding 1 tablespoon of lemon juice or vinegar to 1 cup of milk. Stir, let it sit for about 5 minutes. You can use this is place of the buttermilk. Go ahead and add the baking soda. This should solve the problem…I hope. If not, set me a note and we can figure this out together. Happy baking! Thank you, Paula. I really appreciate your positive comment. You CAN do this. I hope you give the biscuits a try. I made these twice now, following directions word for word but each time the biscuits came out tough. They look.and smell fabulous but come out too chewy. I tried being even more gentle with the dough the second time around and still the same results. I still ate them, but im not giving up, gonna try again soon. I am SO impressed. I have been trying biscuit recipes for almost 3 years. These are the best yet! I wish I could post a picture!!! MMMMMMMMMMMM!!!! Thanks for a great recipe and great instructions! I just made these with wheat flour and the high altitude adaptation (minus 1 tsp. sugar also) and baked 22 minutes. Fabulous does not even begin to describe how wonderful they are. And we made some sausage gravy to go with it…amazing…I think I may love you 🙂 YUM! Oh my! This sounds amazing! Thanks for sharing. What a great idea. I'm so glad you were happy with the recipe. I just discovered your blog!! I have made that fabulous crusty bread in regular and rye a couple of days ago– have you listened to it crackle when it first comes out of the oven! That is an awesome recipe. 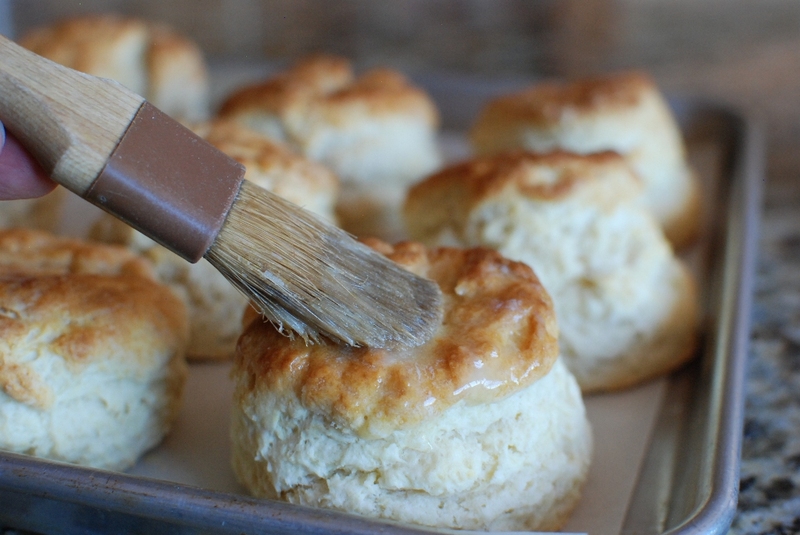 In the morning I'm making these biscuits. Have you tried substituting coconut oil for any of the butter? It makes great pie crust! As it is so healthy I'm trying to use it in more recipes. I'm making the biscuit recipe as written in the morning but will exchange some of the butter for coconut oil in the second batch. Thanks for sharing such great recipes– all of them look sooooo good! I'm so glad you discovered me. I can't wait to hear how the coconut oil works out in the biscuits. I love using coconut oil and need to incorporate it more in my recipes. Thanks for the reminder and let me know how your biscuits turn out. Hello! ,i love your blog and i made these biscuits tonight! Hands down the best biscuits i have ever had or made! Every recipe i have tried of yours is amazing! I'm in Las Vegas, i don't know if they have a hash house ago go in Utah but they do here and they have really good huge biscuits. These reminded me of them! Thank you so much for a great recipe. Where did you get the recipe? Or did you create it yourself?? 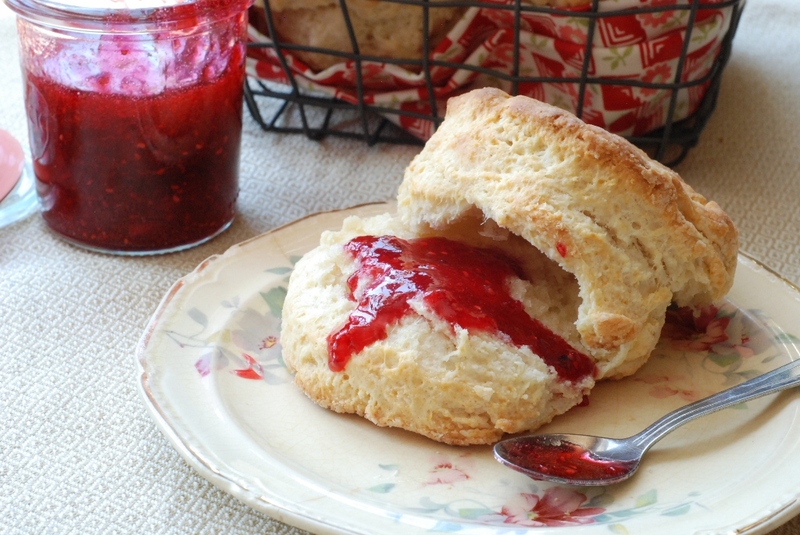 Do you think I could make these using a buttermilk subsitute of whole milk and vingar or does it need real buttermilk? I think you could try the milk and vinegar. It's a great substitute for buttermilk. Janet, I tried making the biscuits per your advise, and they turned out great! Thanks for the help! Whew! That's always such a relief to hear success stories. Thank you for your comment. quick question about your food prep (but not pertaining to actual food)… WHERE DID YOU GET THAT GORGEOUS BOWL??? That lovely bowl is a Mason Cash bowl. I just love it and can kick myself for not buying more. They are made in England and are pretty tough to find these days. Every now and then they will just pop us somewhere. Love them. I love following your blog! Your recipes inspire me to cook and entertain 🙂 I was wondering if the cloth you use under your dough is some special cloth? I purchased my cloth at a local cooking store. It is just canvas fabric with the edges surged. You can purchase some canvas at a fabric store. I have made a few and I haven't taken the time to sew the edges. They shrink after being washed so cut accordingly. They are just awesome. 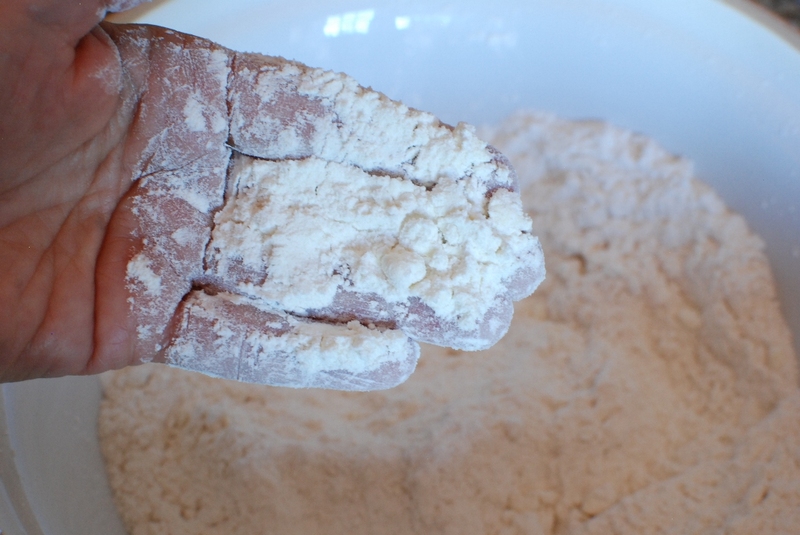 The cloth absorbs the flour so the dough doesn't. I love mine. I so happy to have you following. thank you for your kind comment. After 11 years of marriage, my Southern husband finally told me that I "made a real biscuit! ", thanks to this recipe! These were perfect! So tall and flaky and delicious. I used nonfat buttermilk and they were amazing. Thanks! Thank you for commenting. I love to hear success stories. not only I love your (choice of) recipes but I love how you write them & how they are photographied. You're becoming one of my favorite food blogs ! Thank you for your kind comment. My dream was to have at least one French follower…the ultimate compliment. I hope I don't disappoint you. I just pulled a batch of these out of the oven! They look so beautiful that I had to take pics. I will send them if you like! Took my first bite and had to go sit down. We'll have these with poached eggs and sausage gravy for brunch. Dinner will be those Jalapeno Cheddar burgers of yours. I just want to let you know that I've NEVER had a recipe of yours let me down. Thanks so much for bringing joy into our household. Happy Mother's Day! I would love to see pics! Your brunch sounds amazing I wish I would have been sitting at your table. I'm so happy you enjoy the recipes that means a lot to me. You made my day! I hope someone makes you biscuits for mothers day. These look like something I need to make. I am a big buttermilk fan. Recipe Printed! 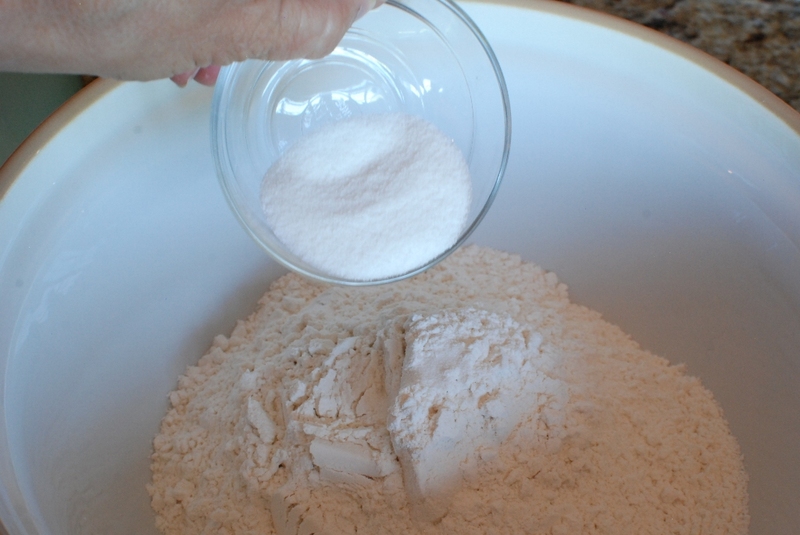 Janet, would this recipe work with 100% whole wheat flour? Also, is there an acceptable non-dairy substitute for the buttermilk, say coconut milk? I just love drooling over your photos! Thank you for making this blog! I just KNEW I was going to get asked this question! I actually worked the answer out to this question in my mind. Hmmm would I actually think that I needed a whole wheat biscuit??? Is it worth it to take something not particularly healthy and try to make it healthy? For me…probably not. I'm adding a boat load of butter so what's the use. So to truly answer your question I think you could start off by making the bisciut 50% white and 50% whole wheat. 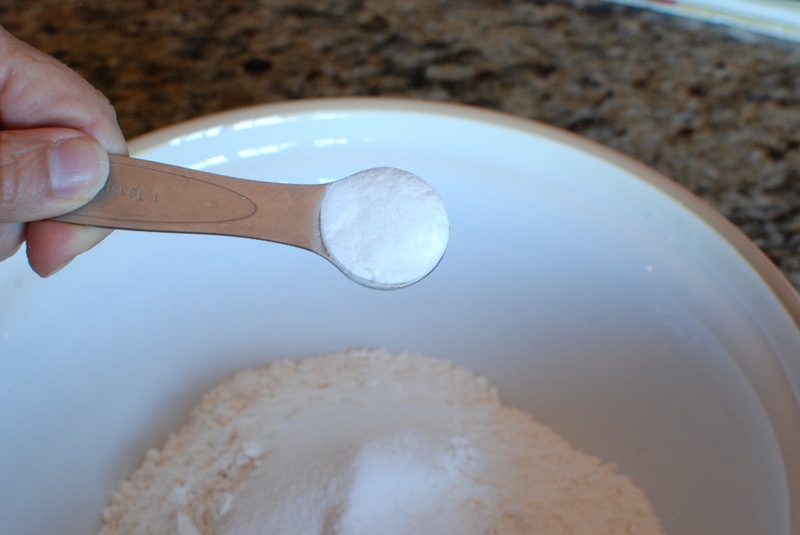 If you use the coconut milk, I think you could omit the baking soda. 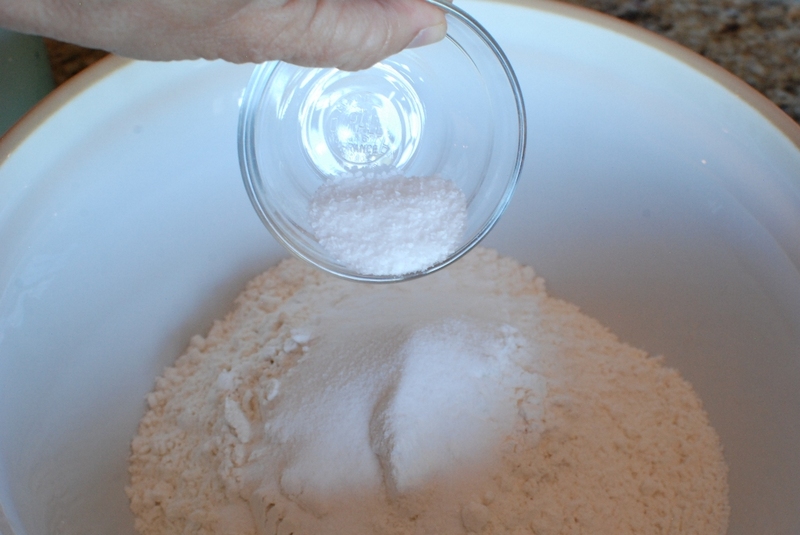 The acid in the buttermilk requires the use of baking soda. So give it a try and let us all know what you think. These look so amazing! I always love your recipes… even linked you on my blog for food inspiration!! Thank you for the link. I will absolutely follow along on your blog. Thanks for linking us together.